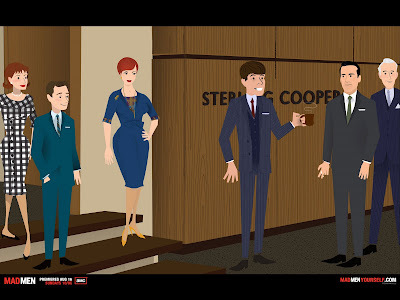 In honor of Mad Men's third season thankfully kicking off on August 16, I built myself into a character from the show with the help of AMC's Web site. I'm the dandy with the blue suit and the coffee. Rachel says I made myself "too toothy," but I like the rest of my 1960 style. Make yourself. And more importantly, watch this show. Mad Men and Lost are the best dramas ever shown on TV. i just mad men'd myself, too. Can you believe it's been 5 years since I worked at NACo. I get a 10-week sabbatical at WRI in a few weeks. That's how long it's been since we worked together! Anyway, hope you liked your Mad Men self.